An excellent traditional seaworthy ketch, from the 2 CQR anchors on her twin bow rollers, new Harken Roller Furing 135 genoa to her rack pinion wheel steering in the cockpit. 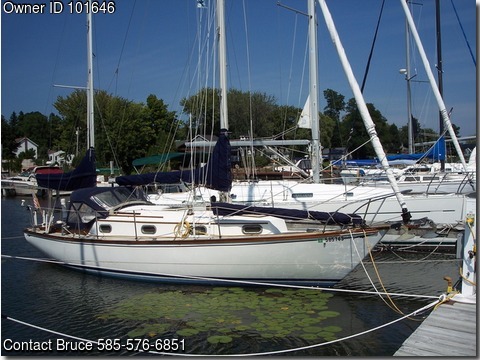 Due to her less-corrosive life on great lakes fresh water she continues to provide safe, comfortable cruising and is a joy to sail. On the stern rail we have gas grill, outboard bracket, fog bell, horseshoe flotation, and auto-pilot antennae. In the cockpit are engine controls to starboard, auto-pilot steering left of wheel, engine gauges forward, bulkhead mounted new depth gauge, speedometer, and compass, with self-tailing sheet whinches pn coaming port and starboard. Halyards, topping lift, and Roller Furling are lead to cabin top near hatchway. Going down companionway stairs reveals galley to port with CNG 4 burner stove and oven, SS sink providing pressure hot cold water with additional foot pump when hands are busy,dish storage, and microwave. Large icebox is to starboard as is the electrical AC and DC switch center. Going forward thru salon setteebunks are PS with a great sound system, super cabin stove, chronometer, hand held compass, and book rack on bulkheads, with hanging locker and head with shower forward to port and starboard. Behind closing doors is the nice sized Vee Berth with entry to chain locker. Look at the photos carefully and you will see many items I didn't include like big hatches on the cockpit sides, steps in both main and mizzen masts, good sails with extra reef points for those nervous times when leaving an anchorage -, bronze opening ports, and a cozy cabin you won't want to leave. It took me many years to finally get my Cape Dory Ketch and now I am moving up to bigger.